When it comes to finding the right freediving fins, you will realise that although they all serve a common purpose, they actually vary greatly in terms of material, stiffness and length. There a a lot of misconceptions and misunderstandings on the subject of selecting the right pair and there are a lot of aspects to consider. This article will explain the different types of fins, the difference between freediving and scuba fins and will advise you on what you need to know to select the best pair. Whether you are just starting out or you are a pro looking to up your game, this guide will fill you in on the right move for you. So how exactly do you differentiate the two? Design tailored freediving fins differ from the traditional scuba equipment in their flexibility. Their long and slender blades enable the diver to make use of slow, efficient strokes while still offering the ability to provide some notable propulsion when it is needed. The freediving fin’s foot pockets are generally pretty comfy and the fin’s shape means that you have outstanding control of direction while requiring less effort. You need to consider a few factors when trying to select the right pair of freediving fins. The blade material, stiffness and length are quite key. Overall, the longer blades are most preferable, especially for deeper diving, because they give you a lot more propulsion which you need for ascent and they decrease your exertion of energy during your descent. When you exert less energy, you waste more oxygen and improve your breath hold so this is vital. Another vital factor when you are deciding on fins is their fit. The correct fit will give you more efficiency, power and above all, comfort. Fins that do not fit well result in less power, blisters and cramps. The only way to determine their fit is to try them on, ensuring that you are wearing neoprene socks. Try on a variety of models and sizes to get the best idea of what works for you. The fit you are looking for in a fin which fits you snugly enough that there is no slack without being too tight. If you fins fare too tight then you will struggle with cramping feet when you dive. The fin’s silicon or rubber foot pockets tend to conform quite nicely to your feet, but be sure that the fin’s pocket isn’t designed to be too wide or too narrow for your feet, as the foot pockets don’t alter their shape over time. All fins on the market are basically categorised into two main types, open heeled or closed heeled. 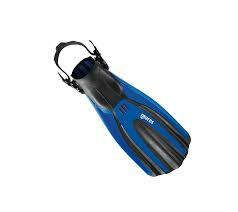 While open heeled fins are very popular with scuba divers, there are actually quite a few variations of the open heeled fins available which are specifically designed for freediving. The most obvious pros to closed heel fins are their secure fit and their streamlined design. Open heeled fins have overall a more bulkily-designed foot pockets which are known to cause loose fit and the resultant loss of power. Because of this, close heeled fins are more preferable to freedivers. Their secure fit provides more power and the streamline of their design reduce drag in the water. Open heeled fins do have their advantages, too though. They are quite easy to wear and you have the option to wear dive boots with hard soles if you want to. This is nifty when you want to dive in an area where its access features sharp rocks and tricky terrain; the boots protect your feet and you can easily slip into the fins when you reach the water. 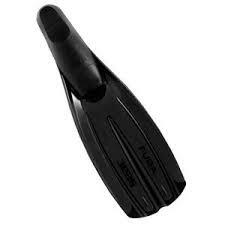 You usually will find freediving fins available in varying levels of stiffness. In order to understand which level of stiffness is right for you, take into account your body shape and how muscular you are. 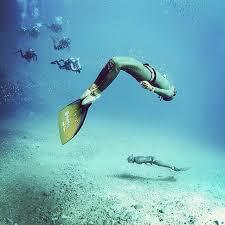 A freediver who has longer legs produces a weaker propulsion than someone who has short, bulkier legs. We recommend softer blades for divers with weaker propulsion, but medium to soft blades are quite suitable for everyone. There are three types of freediving blades materials; they are generally made out of either carbon fiber, fiberglass or polymer plastic. Carbon Fibre Fins are at the top of the price range and are far more efficient than polymer plastic or fibreglass blades. Fins which have carbon blades provide the most propulsion from the least amount of energy. These fins are lightweight and quite fragile but they are entirely memory free, so they will remain straight and stiff and will not bend with use like the polymer plastic ones do. Fibreglass Fins these are in the middle range price-wise. Their chief advantage is the fact that fibreglass will not change shape with use. These fins are very sturdy and can withstand bumps and collisions. Polymer Plastic Fins are the most commonly used freediving fins and are least costly. Even though they are not as expensive as the others, they do their job well. Polymer plastic fins are also quite sturdy and able to handle scratches and bumps caused by collisions. Their main disadvantage is that they weaken and become less efficient over time. 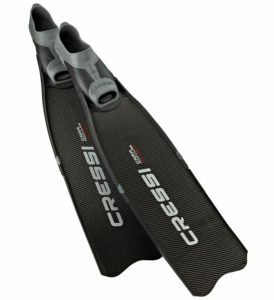 The Modular Carbon is the flagship of the Gara line from Cressi. It features a blade which can be removed as well as a specialized foot pocket. Here the carbon blade is extended into the foot pocket which stiffens the heel and it’s long, narrow rails channel water and prove maximum thrust. The foot pockets have an expansion zone which means that the fins can be worn barefoot or with socks. The foot pockets feature traction pads for power efficiency, a stiff compound around the side and soft rubber around the foot for comfort. The fins disassemble making them perfect for traveling. 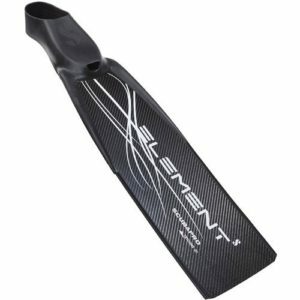 Carbon fibre blades provide a lightweight, stiff blade which gives outstanding propulsion to experienced divers. The Scubapro is a very powerful fin with a blade made 99% out of carbon. It features narrow side rails to channel water along the blade and with the along with its aerodynamic design prevent drag in the water. A featherweight at only 1.5lb, the Scubapro features a foot pocket which is non-detachable with a notably thinner blade which is only coated on the top surface. The feel and fit of the foot pocket, the contours, and size of the support rails as well as the shape and length of the blade all contribute towards making these fins powerfully efficient in maximum propulsion with minimum effort. We often find that gear with a dual purpose tends to fulfill neither purpose very well, but such is not the case with the Avanti Quattro Power. 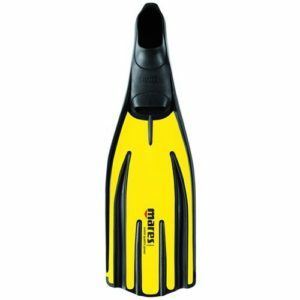 The Quattro Power is a fool-foot fin which features and flexible tip, a 4-channel blade and lively action and as far easier to maneuver than specialised freediving fins are. If you want to use what the professionals are using, then give these fins a try. They have an outstanding torsional stiffness which will prevent the fins from twisting when you kick. The fins tend to track a lot straighter, unlike twisted fins which actually steer your leg and foot muscles, wasting precious energy in an attempt to stabilize your kicks. 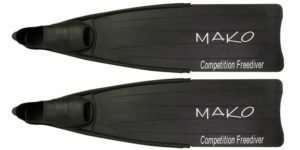 Why not take your freediving skills to an entirely new level by teaming up with this high performing pair of Mako’s Competitions FG (Fibreglass Composite) freediving blades. 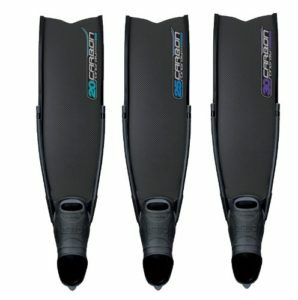 The Competition blades provide the optimal performance you expect from carbon, these fins are in fact more durable, offering you the premium performance that serious spearos and divers are looking for. What’s extra great about these fins is that Mako will customize their assembly for you, tailored to your order. Simply choose your blade stiffness, length and foot pocket size and they will be made spec. Omar’s Stingray carbon fins are characterized by their patented carbon fibre blades which they manufacture with the use of infusion technology. Their innovative double vacuum process ensures that the carbon fibre strands are flawlessly impregnated within the resin and there is no risk of forming microbubbles kicks. The blades are interchangeable and come in 3 stiffness levels, that is 30 is hard, 25 is medium and 20 is soft.